The migration is only beginning, but that's only half the story. You know it's serious when the newspaper of record finally reports it: A $76,000 Monthly Pension: Why States and Cities Are Short on Cash (New York Times). It's a long article but the summary is brief: corrupt politicos promised the moon to public employees, and now the fiscal chickens of insolvency are coming home to roost. Public pension obligations are rising so fast that even repeated tax increases can't keep up. This is setting up a second front in the war between entitled Baby Boomers and younger taxpayers who pay most of the federal and local taxes. Public pensioners are a subset of the entitled Baby Boomers, but their pensions can't be paid with borrowed money like Social Security and Medicare; public pension obligations come out of local and state taxes, and as those obligations soar then public services must be slashed and taxes jacked up by annual double-digit increases. So there is a war brewing between public pensioners and the Tax Donkeys: the Unprotected who pay local property taxes on their homes, state and local taxes on their incomes, sales taxes on their purchases, junk fees on local government services, and so on. Corrupt politicos created the war by over-promising benefits to public employees and ignoring fiscal realities. By the time the bill comes due, the politicos who rubber-stamped the unaffordable promises are themselves gorging at the public-pension retiree trough. Not every public employee is receiving gold-plated pensions and benefits, of course, but that doesn't negate the reality that nationally, public pensions are increasing faster than government revenues and the returns earned by the pension programs. If the stock and bond markets suffer multi-year declines, even modest declines, the pension war will move from skirmishes to open political combat. The 2008-09 Global Financial Meltdown was a taste of the reality facing public pension programs: once annual returns slip from +7% annually to -7% annually, the pension plans are soon insolvent. Like virtually all wars, there are asymmetries between the two combatants: in the war between public pensioners and the Tax Donkeys, the pensioners can't switch pension programs, but the Tax Donkeys can move to lower-tax states. Unlike Communist regimes which strictly control who has permission to transfer residency, Americans are still free to move about the nation. This creates a very Darwinian competition between sclerotic, corrupt, overpriced one-party-dictatorship states whose hubris-soaked political class is convinced the insane housing prices, tech unicorns, abundant services, and a high-brow culture ruled by an artsy elite are irresistible to everyone, and locales that are low-cost, responsive to the Tax Donkey class, welcoming to new small businesses, employers and talent, unbeholden to a politically-correct dictatorship and conservatively managed, i.e. 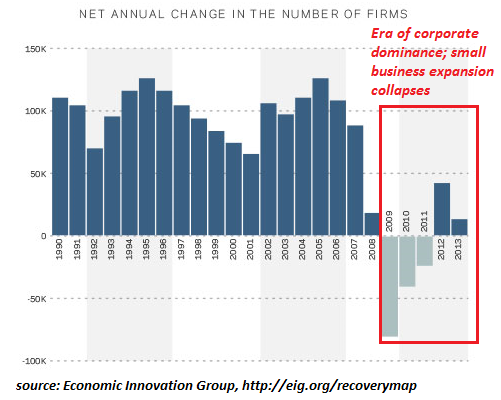 not headed for insolvency, are no match for their elitist fiefdoms. Not everyone can move. Many people find it essentially impossible to move due to family roots and obligations, kids in school, and numerous other compelling reasons. Many people who are able to move are the Tax Donkeys who are paying the most taxes: self-employed entrepreneurs, mobile creatives, those with scarce skills and those who earn substantial incomes from royalties, patents and other forms of capital. These Tax Donkeys can live pretty much anywhere they please. They don't need to stay in NYC, Boston, L.A., San Francisco or Chicago. This is the model for many half-farmer, half-X refugees: people who are moving to homesteads or small towns with the networks and skills needed to earn a part-time living in the digital economy. In a lower cost area, they only need to earn a third or even a fourth of their former income to live a much more fulfilling and rewarding life. Not that hubris-soaked politicos and elites have noticed, but only the top few percent of households can afford to own a home in their bubble economies. Paying $4,000 a month in rent for a one-bedroom cubbyhole in San Francisco may strike the elites living in mansions as a splendid deal, but to the people who have surrendered all hope of ever owning anything of their own to call home--not so much. Not that hubris-soaked politicos and elites have noticed, but the Tax Donkeys are getting fed up: their local schools have been stripped of enrichment programs, the cash-strapped local governments are demanding taxpayers pass $100 million bonds to fill potholes and repair schools' leaking roofs, parking tickets now cost more than a restaurant meal for the entire family, and the increases in fees and taxes are coming fast and furious. 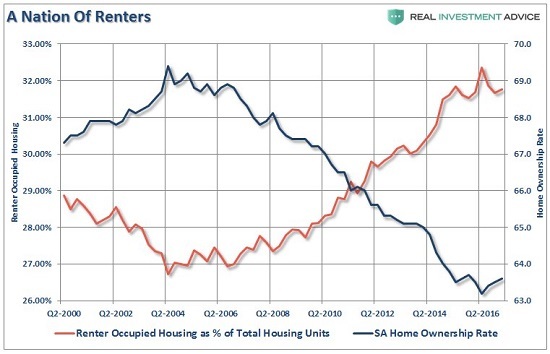 If the real estate and stock/bond bubbles pop, the pension bubble pops, too. Once property taxes start declining even as rates are jacked up, the public pensioners will lose the war. Once the stock and bond portfolios of the pension programs are shrinking rather than growing, the the public pensioners will lose the war. Which American Cities Will File Bankruptcy Next? There is a feedback loop to raising taxes to pay for skyrocketing public pension obligations: the higher taxes rise, the more Tax Donkeys will migrate away from high-tax states and cities. 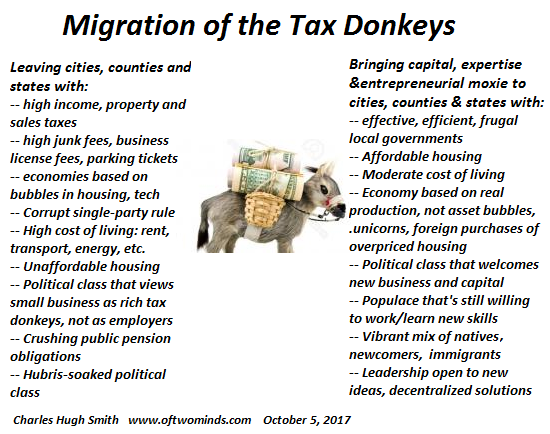 As those paying the majority of the taxes leave, the high-tax states and municipalities have no choice but to raise taxes even more aggressively, which only accelerates the migration of high-income, entrepreneurial Tax Donkeys that are the engines of growth. The migration is only beginning, but that's only half the story: those who can't leave for whatever reason can opt out: close their businesses, quit their high-stress, high-paying job, move back to the family home, retire and start living as close to the ground as possible. Those who opt out are in effect moving from those contributing the most to those contributing the least. Right now, hubris-soaked politicos and elites can entertain the fantasy that NYC, Boston, LA, San Francisco, Chicago, etc., are irresistible: they're not. They're great for those feeding at the trough but not so great for those filling the trough. As astonishing as it will be to hubris-soaked politicos and elites, the straws that will break the back of the Tax Donkeys' will to put up with the ever-increasing burdens are many. My new book Money and Work Unchained is $9.95 for the Kindle ebook and $20 for the print edition. Read the first section for free in PDF format. If you found value in this content, please join me in seeking solutions by becoming a $1/month patron of my work via patreon.com.